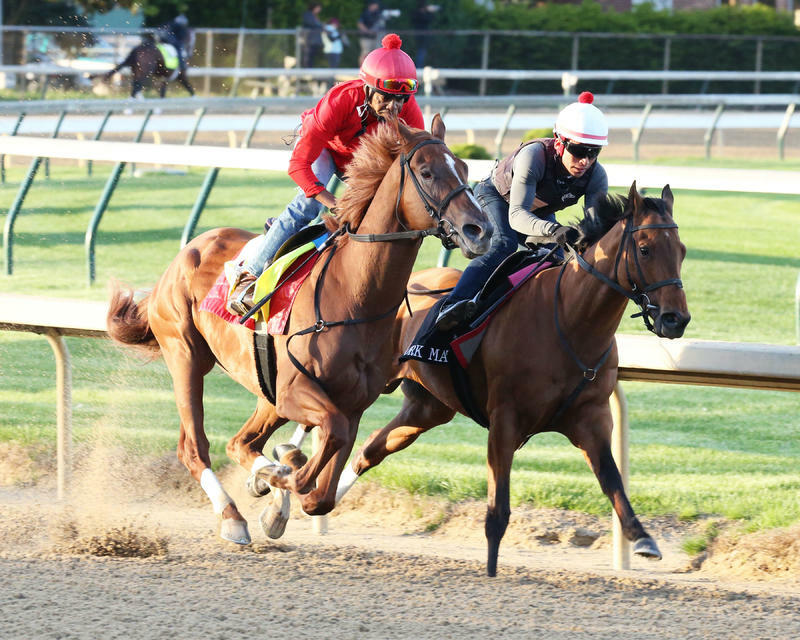 Magdalena Racing, Gainesway Stable and Harold Lerner’s Ashland (GI) runner-up Eskimo Kisses breezed five furlongs in 1:01.20 for trainer Kenny McPeek in a tune-up for next week's Longines Kentucky Oaks (GI). E Five Racing Thoroughbreds and Stonestreet Stables’ 2-year-old champion Good Magic headed a group of six hopefuls for next Saturday’s $2 million Kentucky Derby Presented by Woodford Reserve (Grade I) putting in works at Churchill Downs on a Chamber of Commerce Saturday morning. 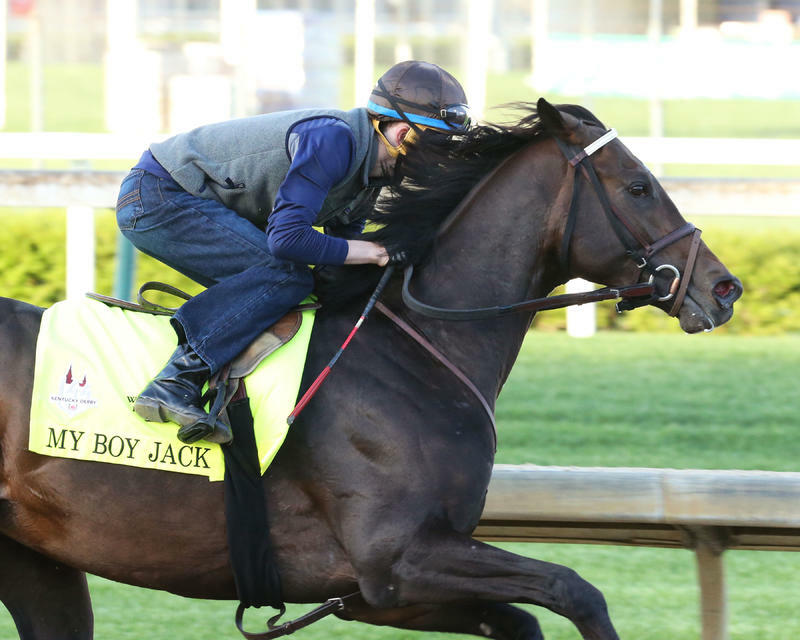 Good Magic worked five furlongs in 1:01.20, Flameaway worked a half-mile in :47.80, My Boy Jack worked five furlongs in 1:03.20, Free Drop Billy worked a half-mile in :49.40 and Promises Fulfilled worked five furlongs in 1:00.40. 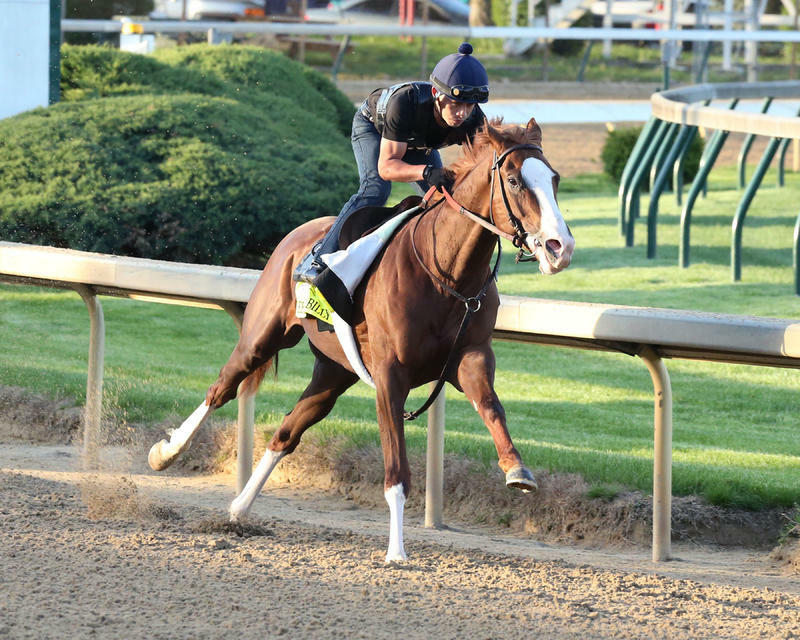 All of those works occurred during the 7:30-7:45 training window reserved for Derby and Kentucky Oaks horses. Working at 5:30 was Bravazo, who worked five furlongs in 1:01.40. Blended Citizen breezed one mile in 1:41.60 Saturday morning at Keeneland under jockey Kyle Frey. Bolt d’Oro worked a half-mile in :48.20 Saturday morning at Santa Anita. Firenze Fire worked a half-mile over the Belmont Park training track in :51.02. Monomoy Girl, who figures to be one of the favorites for the $1 million Longines Kentucky Oaks (GI), worked five furlongs in company in 1:01.60. Other Oaks fillies working at Churchill Downs were Sassy Sienna (half-mile in :49.20), Blamed (half-mile in :48.40) and Eskimo Kisses (five furlongs in 1:01.20). Working at Santa Anita Saturday morning was Midnight Bisou, who covered six furlongs in 1:13.80 and Rayya (five furlongs in 1:01.80). AUDIBLE/MAGNUM MOON/NOBLE INDY/VINO ROSSO – Many – in fact the majority – of trainers choose to walk their horses the day after a workout, but not so with multiple-Eclipse Award winner Todd Pletcher. He sends them back to the track. What he saw from his stakes-winning crew of Audible, Magnum Moon, Noble Indy and Vino Rosso pleased him. Saturday, the four colts under their regular exercise riders stretched their legs and took a turn standing in the starting gate. Magnum Moon (Nick Bush) and Vino Rosso (Adele Bellinger) each jogged a mile, while Audible (Amelia Green) and Noble Indy (Carlos Cano) galloped the same distance. 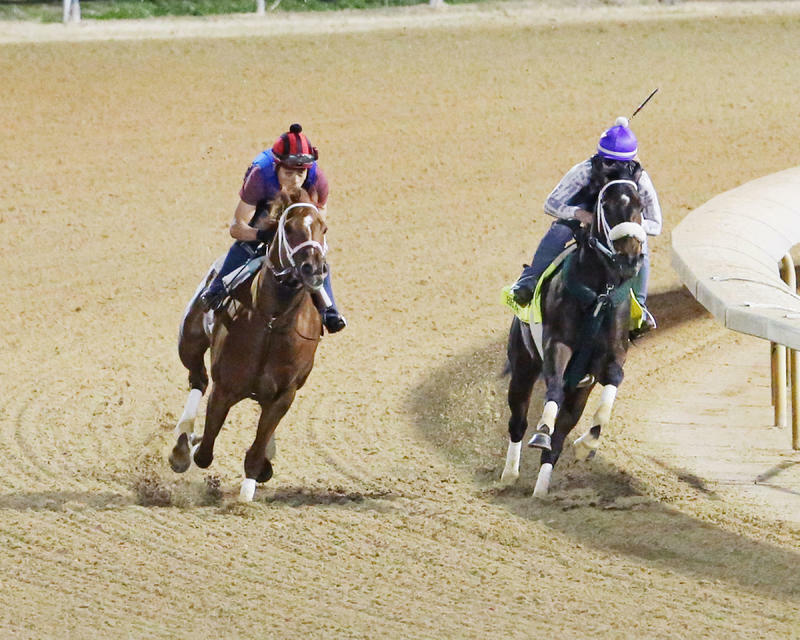 The previous morning they had been timed in half-mile drills at :49.40 (Audible), :47.40 (Magnum Moon), :47.20 (Vino Rosso) and a five-eighths move of 1:01.60 (Noble Indy). The bay Audible, hero of the Grade I Florida Derby, is owned by the four-way partnership of China Horse Club International, Head of Plains Partners, Starlight Racing and WinStar Farm. Stablemate Magnum Moon, who rang the bell most recently in the Grade I Arkansas Derby, races for Lawana and Robert Low. Louisiana Derby (GII) winner Noble Indy goes postward for the pairing of WinStar Farm and Repole Stable, while Wood Memorial (GII) victor is co-owned by Repole Stable and St. Elias Stable. BLENDED CITIZEN – Greg Hall and SAYJAY Racing’s Blended Citizen worked one mile at Keeneland in 1:41.60 Saturday morning under jockey Kyle Frey, according to trainer Doug O’Neill’s assistant Jack Sisterson. The Jeff Ruby Steaks (GIII) winner is No. 21 on the Kentucky Oaks leaderboard. Ship date is to be determined. BOLT d’ORO – Owner/trainer Mick Ruis said he got “exactly what we wanted” Saturday morning at Santa Anita Park in California when his Kentucky Derby-bound ace Bolt d’Oro drilled four furlongs in :48.20 at 7:45. With three-time Kentucky Derby winning rider Victor Espinoza in the tack, the husky son of Medaglia d’Oro put in his final bit of exercise for the 144th Run for the Roses much to the delight of the mercurial Ruis. Espinoza, who scored in the Kentucky Derby with War Emblem (2002), California Chrome (2014) and American Pharoah (2015), will handle the $630,000 yearling purchase next Saturday. Ruis was on his way to the airport in Los Angeles for a flight to Kentucky and a first-time visit to Chestnut Farm, a facility he’d recent purchased that is located approximately four miles from Keeneland Race Course. Bolt d’Oro will ship to Louisville Monday on a flight with several California horses bound for stakes engagements at Churchill Downs. Ruis said he will drive over from Lexington to meet him that day. BRAVAZO – Calumet Farm’s homebred Risen Star (GII) winner Bravazo breezed five furlongs in 1:01.40 Saturday morning at 5:30 with exercise rider Danielle Rosier aboard for Hall of Fame trainer D. Wayne Lukas. Breezing inside maiden Berko (1:01.80), Bravazo started two lengths behind and worked through splits of :14, :26 and :37.80 before galloping out six furlongs in 1:15, according to Churchill Downs clocker John Nichols. Lukas confirmed Saturday Luis Contreras will have the mount on the first Saturday in May. COMBATANT/DREAM BABY DREAM – With exercise rider Angel Garcia up, Winchell Thoroughbreds and Willis Horton’s Combatant galloped 1 ½ miles for Hall of Fame trainer Steve Asmussen. Needing two defections to make the field, Dream Baby Dream Stable’s Dream Baby Dream galloped 1 ½ miles with Juan Vargas in the saddle. ENTICED – Godolphin’s multiple graded-stakes winner Enticed galloped at Palm Meadows Training Center Saturday morning for trainer Kiaran McLaughlin. Winner of the Kentucky Jockey Club (GII) here last fall, Enticed is scheduled to gallop again Sunday morning before beginning the ship to Kentucky in the afternoon for a Monday arrival at Churchill Downs. Junior Alvarado, who was aboard for the victory here last fall, has the mount in Derby 144. FIRENZE FIRE – Mr. Amore Stable’s Firenze Fire worked a half-mile on his own in :51.02 over the Belmont Park training track. Paco Lopez has the Derby call on Firenze Fire. FLAMEAWAY – John Oxley’s Flameaway worked four furlongs in company in 47.80 for trainer Mark Casse during the 7:30-7:45 training window for Derby and Oaks horses. Ridden by Chris Garraway, his splits were 11.60, 22.80 and 34.80, galloping out in 1:02. Casse was on site for the work. Flameaway’s workmate was John Oxley and My Meadowview Farm’s Ride a Comet, who Casse said will run in the 1 1/16-mile American Turf (GII) on Derby Day. Jockey Jose Lezcano, who has ridden Flameaway in his past three starts this year, has the mount in the Kentucky Derby. Flameaway most recently ran second in the Blue Grass (GII) April 7 behind Good Magic. FREE DROP BILLY/PROMISES FULFILLED – It was a busy morning at Churchill Downs’ all-time leading trainer Dale Romans’ Barn 4 Saturday with his two Derby contenders – Albaugh Family Stables’ Free Drop Billy and Robert Baron’s Promises Fulfilled – completing their major preparations for the Kentucky Derby Presented by Woodford Reserve (GI). Front-running Fountain of Youth (GII) winner Promises Fulfilled breezed a half-mile in :48 with Juan Segundo up through splits of :12 and :24.40 before galloping out five furlongs in 1:00.40 and six furlongs in 1:13, according to Churchill Downs clocker John Nichols. With Faustino Herrarte aboard, Blue Grass third-place Free Drop Billy worked a half-mile in :49.40 with splits of :12.60 and :37, according to Nichols. With 710 victories at Churchill Downs, Romans surpassed Hall of Fame trainer Bill Mott’s all-time win tally last fall. Both trainers do not have a victory in the Kentucky Derby. Corey Lanerie has the mount on Promises Fulfilled while Robby Albarado rides Free Drop Billy. GOOD MAGIC – Last year’s Eclipse Award-winning Champion 2-Year-Old Male, owned by e Five Racing Thoroughbreds & Stonestreet Stables LLC, put in his final pre-Derby work, breezing five furlongs in 1:01.20 under exercise rider Walter Malasquez. Churchill Downs clockers recorded splits of 12.80, 24.80, 36.60 and 49.40. Trainer Chad Brown timed the work in 1:00.80 with a six-furlong gallop-out of 1:13.80 and seven-eighths in 1:27.20. 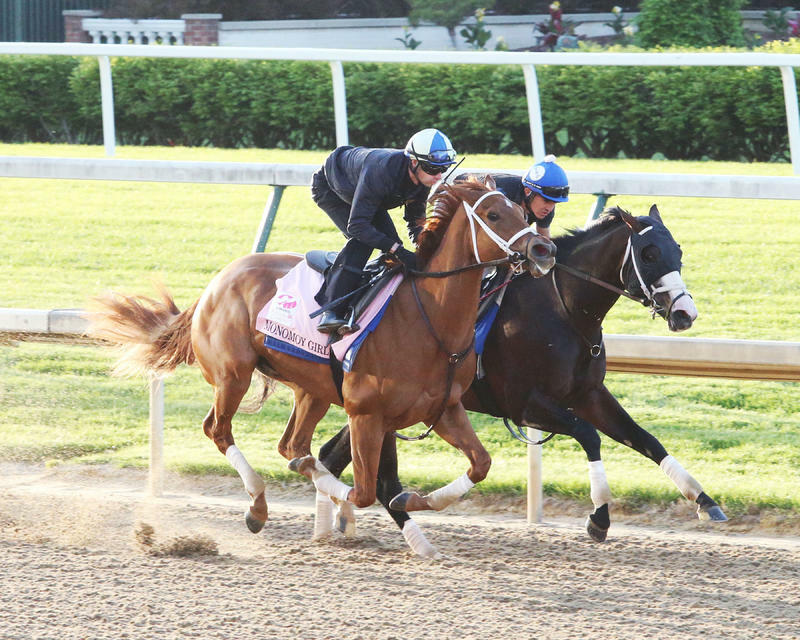 The work unfolded at 7:30 a.m., during the exclusive Derby and Oaks training session. Malasquez wasted little time getting down to business, getting on and off the track while many of the other Derby horses were still backtracking and taking in their surroundings. Brown was in communication with Malasquez from the frontside during the work but said he only used the radio to confirm early on that they weren’t going too fast. “The time is a guideline to see where we’re at, but really it’s how he’s moving, how he pulls up, soundness-wise and fitness-wise, and so far he’s done everything we’ve asked him to do,” Brown said. Winner of the last two Eclipse Awards as the nation’s top trainer, Brown has been openly enthusiastic about Good Magic’s chances at wearing the roses, especially relative to the other very good horses he’s brought here, like Normandy Invasion, fourth in 2013, and Practical Joke, fifth last year. “He’s the best horse we’ve ever taken to the Derby, for sure,” Brown said. “He has all the qualities that I think it would take. He’s a highly regarded 2-year-old champion, has the right pedigree, good looking, sound, and enormous ability. The Breeders’ Cup Juvenile (GI) and Blue Grass Stakes (GII) winner will be piloted in the Derby by the 2017 Eclipse Award winner as Outstanding Jockey, Jose Ortiz, who has been aboard since Good Magic’s second start. HOFBURG – Juddmonte Farms Inc.’s homebred Florida Derby (G1) runner-up Hofburg galloped about 1 1/2 miles under exercise rider Penny Gardiner, the former jockey who rode in the 1970s, raised two jockeys (Mark Chavez and Casey Chavez), and then rode races again in the mid-1990s. Hall of Fame trainer Bill Mott reported that Hofburg “went very well” and has impressed him the past few days since arriving at Churchill Downs. The Derby will only be Hofburg’s third start of 2018 and fourth overall. He broke his maiden on March 3 before earning all 50 of his “Road to the Kentucky Derby” points with the good second in Gulfstream’s $1 million Derby prep, finishing three lengths behind the winner but more than seven lengths clear of the third-place finisher. Hofburg is scheduled to work Sunday during the Derby training session with Gardiner up and will school in the paddock during racing Tuesday. Irad Ortiz Jr. has the Derby mount. INSTILLED REGARD – OXO Equine’s Instilled Regard galloped at Santa Anita Saturday morning and is scheduled to work at 6:30 a.m. Sunday with a Monday departure scheduled for Churchill Downs, according to trainer Jerry Hollendorfer’s assistant Dan Ward. JUSTIFY/SOLOMINI – The undefeated Santa Anita Derby winner and presumptive Kentucky Derby favorite walked the shedrow at Hall of Fame trainer Bob Baffert’s Santa Anita Park barn the day after posting a seven-furlong workout in 1:25.20. The work elicited rave reviews from onlookers for the way Justify accelerated around the Clubhouse turn. Breeders’ Cup Juvenile (G1) runner-up Solomini – owned by Zayat Stables LLC, Mrs. John Magnier, Michael B. Tabor & Derrick Smith – had an easy gallop this morning and is scheduled to work Sunday at Santa Anita, according to Zayat Stables racing manager Justin Zayat. The Baffert contingent for Derby weekend stakes, also including Kentucky Oaks contender Rayya and last year’s Kentucky Oaks winner Abel Tasman, is expected to arrive Monday afternoon. LONE SAILOR – G M B Racing’s Lone Sailor walked Tom Amoss’ Barn 29 shedrow following his half-mile breeze in :48 Friday morning. MENDELSSOHN – UAE Derby (GII) winner Mendelssohn is expected to arrive in Louisville Monday at 5:30 p.m., according to Director of the Stable Area Steve Hargrave. The colt is expected to stay in quarantine for 42 hours and could train Thursday morning. MY BOY JACK – The stretch-running colt worked in his usual style Friday morning, starting off nice and easy but finishing up nice and strong for trainer Keith Desormeaux during the Derby/Oaks training break at 7:30. The Cajun trainer’s brother – Kent (he of the Hall of Fame) – is the dark bay’s usual pilot, but for this exercise the conditioner called on a Cajun pinch hitter to handle the controls. Rider Brian Hernandez Jr. was in the tack as he broke off the Southwest (GIII) and Lexington (GIII) stakes winner at the five-furlong pole en route to a five-panel clocking of 1:03.20. Churchill Downs’ clockers assigned splits of :13.60 and :38.40 along the way and tacked on a gallop out time of 1:16.60. Desormeaux noted further that “Jack” has 10 starts coming into the Run for the Roses, the most by any horse in the likely 20-horse field. My Boy Jack is owned by the three-way partnership of Don’t Tell My Wife Stables, Monomoy Stables and West Point Thoroughbreds. He has a bankroll that reads at $645,145 a week in front of his date in the $2 million guaranteed Kentucky Derby. About an hour before My Boy Jack went through his exercise, Desormeaux worked another horse with a Kentucky Derby connection. With the stable’s exercise rider Peedy Landry up, Sonneteer registered a half-mile drill in :51.60. A check of the 2017 Kentucky Derby chart would show that the dark colt had finished 16th in the race won by Always Dreaming. SHAPING UP: THE KENTUCKY DERBY – Likely starters in the 144th running of the $2 million, Grade I Kentucky Derby Presented by Woodford Reserve to be run for 3-year-olds at 1 1/4 miles on Saturday, May 5: Audible (jockey Javier Castellano), Bolt d’Oro (Victor Espinoza), Bravazo (Luis Contreras), Enticed (Junior Alvarado), Firenze Fire (Paco Lopez), Flameaway (Jose Lezcano), Free Drop Billy (Robby Albarado), Good Magic (Jose Ortiz), Hofburg (Irad Ortiz Jr.), Instilled Regard (Drayden Van Dyke), Justify (Mike Smith), Lone Sailor (James Graham), Magnum Moon (Luis Saez), Mendelssohn (Ryan Moore), My Boy Jack (Kent Desormeaux), Noble Indy (Florent Geroux), Promises Fulfilled (Corey Lanerie), Solomini (Flavien Prat), Vino Rosso (John Velazquez). Possible starters within the Top 20 on the preference list: Combatant (TBA). Next up in order of preference: Blended Citizen (Kyle Frey), Dream Baby Dream (TBA), Restoring Hope (TBA), Sporting Chance (TBA), Givemeaminit (TBA) and Pony Up (TBA). AMY'S CHALLENGE - Trainer Mac Robertson reported Saturday morning that Novogratz Racing Stables' Amy's Challenge, No. 12 on Kentucky Oaks leaderboard, was on her way to Churchill Downs from Oaklawn Park. "She just worked a few days ago and will not work at Churchill prior to the Oaks," Robertson said regarding a possible start in the Oaks. "Right now we are keeping all of our options open before we commit." Another option for Amy's Challenge would be the Eight Belles (GII). BLAMED – Cleber Massey’s Sunland Park Oaks winner Blamed worked four furlongs in 48.40 under Robby Albarado for trainer Joel Marr during the 7:30-7:45 training window for Derby and Oaks horses. She galloped out in 1:01.20. This was her second work over the Churchill Downs surface since her arrival in Kentucky from New Mexico. 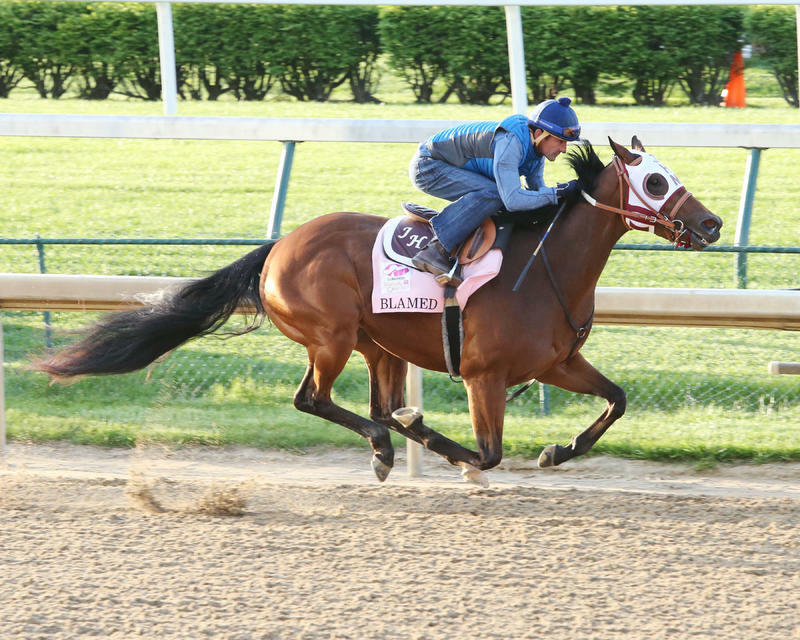 Blamed will walk tomorrow and jog Monday, and will visit the track each day this upcoming week, possibly including Friday, the morning of the Kentucky Oaks. “We’ll just see how she is acting and what she tells us to do,” Marr said. Jockey Ken Tohill has the mount in the Oaks and likely will arrive Tuesday according to Marr. CHOCOLATE MARTINI – Double Doors Racing’s Fair Grounds Oaks (GII) winner Chocolate Martini walked the shedrow Saturday morning following her five-furlong bullet work in :58.80 Friday. Trainer Tom Amoss has yet to confirm a jockey. CLASSY ACT/PATRONA MARGARITA – Trainer Bret Calhoun’s duo of Classy Act and Patrona Margarita walked the shedrow Saturday following their half-mile works in :47 and :50.80, respectively. COACH ROCKS – Gulfstream Park Oaks (GII) winner Coach Rocks walked trainer Dale Romans’ Barn 4 shedrow Saturday morning following her five-furlong move in 1:00.20 Friday at Churchill Downs. ESKIMO KISSES – Magdalena Racing, Gainesway Stable and Harold Lerner’s Ashland (GI) runner-up Eskimo Kisses made her first appearance at Churchill Downs in five months with a five-furlong breeze in 1:01.20 for trainer Kenny McPeek. With jockey Corey Lanerie up, Eskimo Kisses breezed through opening splits of :12.60 and :37.80 before a six-furlong gallop out in 1:15.20. Lanerie has the call for the Oaks. HEAVENHASMYNIKKI – Loooch Racing Stables’ Heavenhasmynikki walked the shedrow a day after working five furlongs in 1:01 on Friday. Trainer Anthony Quartarolo said the filly came out of the work fine and may return to the track to jog Sunday morning. Heavenhasmynikki is 17th on the Kentucky Oaks leaderboard and will need three defections from among the likely entrants Monday to make the 14-horse field. MIDNIGHT BISOU – Trainer Bill Spawr put his finishing touches on his filly Midnight Bisou’s preparations for next Friday’s Kentucky Oaks when he sent the dark daughter of Midnight Lute through a six-furlong drill Saturday morning at Santa Anita Park in California. Clockers at the Arcadia track caught the multiple stakes winner in 1:13.80 for the drill accomplished with jockey Martin Pedroza in the boot. Though Pedroza won’t ride the filly in the $1 million guaranteed Oaks – “Big Money” Mike Smith will – Spawr has used Pedroza regularly in the mornings on Midnight Bisou. Midnight Bisou, a winner of three straight stakes this year, is owned by the partnership of Allen Racing and Bloom Racing Stable. Spawr noted that she’d ship to Kentucky on Monday, along with stablemate Skye Diamonds, who’ll run next Saturday in the $300,000, Grade I Humana Distaff at seven furlongs. Smith will be the stable’s rider there, also. Spawr, who won the 2011 Breeders’ Cup Sprint at Churchill Downs with champion Amazombie (also with Smith aboard), ships to Kentucky on Monday, too. MONOMOY GIRL/SASSY SIENNA/KELLY’S HUMOR – Michael Dubb and Monomoy Stables’ Monomoy Girl completed her major preparation for the May 4 Longines Kentucky Oaks (GI) Saturday morning with a five-furlong breeze in 1:01.60 in company with allowance winner Secret House (1:02). Monomoy Girl is the likely morning line favorite for the Kentucky Oaks, according to Churchill Downs’ morning line odds maker Mike Battaglia. Cox’s other Kentucky Oaks contender, Medallion Racing and Jerry McClanahan’s Fantasy (GIII) winner Sassy Sienna, breezed a half-mile in :49.20 with jockey Gary Stevens in the saddle. Needing four defections to make the field, Ike and Dawn Thrash’s Kelly’s Humor worked five furlongs in 1:02.20 Saturday morning. If the Midnight Lute filly does not make the Kentucky Oaks field she will likely enter the Eight Belles (GII) on May 4 at Churchill Downs, according to Cox. MY MISS LILLY – Courtlandt Farms’ My Miss Lilly jogged twice around the track at 6:30 under regular rider Emerson Chavez, ponied by Monnie Goetz and Bucky. Trainer Mark Hennig’s wife Rosemary is overseeing training while Mark is in New York, and reported that My Miss Lilly will gallop the rest of the week. Mark is set to return Sunday afternoon and will be at Churchill Downs Monday morning. RAYYA – Sheikh Rashid Bin Humaid Al Nuaimi’s UAE Derby (G2) runner-up Rayya breezed five furlongs in 1:01.80 at Santa Anita Park. Rayya will ship to Churchill Downs on Monday with the rest of Bob Baffert’s Derby weekend stakes contenders. RED RUBY – Sandra Sexton and Brandi Nicholson’s Martha Washington winner Red Ruby galloped Saturday morning at Keeneland. Trainer Kellyn Gorder said “it is very unlikely” that Red Ruby would run in the Oaks. Red Ruby is No. 15 on the Oaks leaderboard and the first filly on the bubble for the field that is limited to 14 starters. 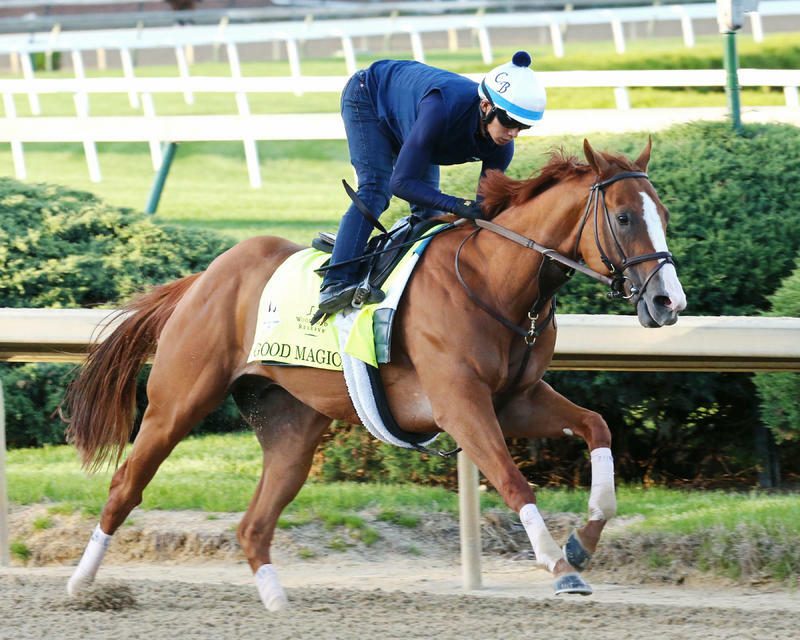 Red Ruby may work Sunday at Keeneland after which a final decision will be made. TAKE CHARGE PAULA – Peter Deutsch’s Forward Gal (GIII) winner Take Charge Paula galloped at Palm Meadows Training Center Saturday morning for trainer Kiaran McLaughlin. Tenth in the Pocahontas (GII) here last fall, Take Charge Paula is scheduled to gallop again Sunday morning before beginning the ship to Kentucky in the afternoon for a Monday arrival at Churchill Downs. Jose Ortiz has the Oaks mount. WONDER GADOT – Gary Barber’s Wonder Gadot walked Saturday morning after working four furlongs in 48.20 Friday. Trainer Mark Casse reported that she will likely have an easy jog tomorrow. 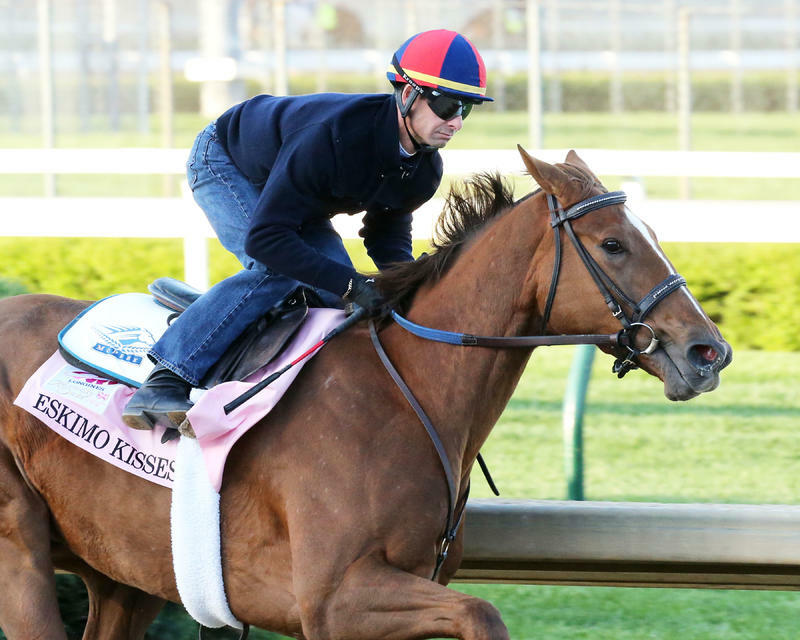 SHAPING UP: THE KENTUCKY OAKS – Likely starters in the 144th running of the $1 million, Grade I Longines Kentucky Oaks to be run for 3-year-old fillies at 1 1/8 miles on Friday, May 4: Blamed (jockey Ken Tohill), Chocolate Martini (TBA), Classy Act (TBA), Coach Rocks (Luis Saez), Eskimo Kisses (Corey Lanerie), Midnight Bisou (Mike Smith), Monomoy Girl (Florent Geroux), My Miss Lilly (Joe Bravo), Patrona Margarita (TBA), Rayya (Drayden Van Dyke), Sassy Sienna (Gary Stevens), Take Charge Paula (Jose Ortiz), Wonder Gadot (John Velazquez). Possible Starters within the Top 14 on the preference list: Amy’s Challenge (TBA). Next up in order of preference: Red Ruby (TBA), Exuberance (TBA), Heavenhasmynikki (TBA), Kelly’s Humor (TBA).